(0 Customer Reviews) | Write Review 4 issues per year The publication is dedicated to covering the vintage trading cards and collectibles market, it is one of the most active segments of the collectibles industry. Their are 112 pages with colourful images and featured articles of interest written by industry expert. The publication is dedicated to covering the vintage trading cards and collectibles market, it is one of the most active segments of the collectibles industry. Their are 112 pages with colourful images and featured articles of interest written by industry expert. 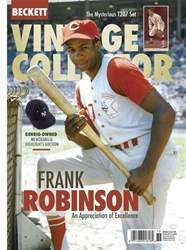 You'll receive 4 issues during a 1 year Vintage Collector magazine subscription. Below is a selection of articles in Vintage Collector April/May 2019. You'll receive 4 issues during a 1 year Vintage Collector magazine print subscription.